Once Digg 4 launched, I was planning on doing an innocent little writeup about how well my favorite social media news site abided by SEO best practices for site relaunches. When Digg 4 “launched” last week, I was shocked to find so many and so frequent errors that I forgot all about Digg SEO. How about just accessing the site? Like myself, I know that many Clickfire visitors love launching websites and take pride in birthing and rebirthing their babies. I can’t help but think of the struggle that every small webmaster goes through fighting for traffic. I wondered why Digg senior management would allow such chaos to go live. Alexa is not a guaranteed accurate measure site traffic for less popular sites. For sites that get a large number of visits like Digg.com, it can be a useful indicator. No one knows for certain what the traffic loss has been since Digg 3 was abandoned, but Alexa says pageviews are down 26% one week after Digg 4. Looking further and listening to blog and Twitter responses didn’t offer a thing in the way of encouragement. There is no way I can even begin to go into the details of what elements are missing and what elements might come back or come halfway back. There are plenty of Digg 4 fix lists being blogged about. Let’s just say that I found that most of the core elements that create enthusiasm were aborted. There is so much criticism out there, too much to keep track of. But, I found a few gems among some who share my sentiments about the Digg 4 failure. digg has become an rss reader with corporate crap and ADVERTS. take a look at the ‘top news’ page. even funnier is how the comments look right now. Back when we were doing Fark TV, someone emailed in a complaint that I’ve never forgotten. They said they didn’t like the show because it was a sketch comedy show that had the name Fark stamped on top. There wasn’t really anything Fark about it. You can’t just stick the Fark name in there and expect the Fark community to just adopt it as their own, they said. Whoever sent that in was right. Digg just made the same mistake. They just scrapped their existing site, replaced it with a new one, and told everyone it was Digg. That’s what everyone’s angry about: it’s not Digg, and they really resent being repeatedly told that it is. How much oil has the squeaky wagon wheel on the fail trail received? Not much. Kevin Rose responded with a bug fix punch list and a tweet or two about most of the Digg 3 features coming back. Most of my friends are kind of hanging back like myself in the hopes that the Digg we all knew and loved will return. Perhaps this is a Sacha Baron Cohen/Eminem MTV Movie awards publicity stunt or new Coke moment. Many Digg 3 users are reported to be moving to Reddit, a frequently featured publisher site on the Digg 4 front page now. Digg users received the above “We’ve Created A Monster – The New Digg Is Here” email promotion on September 1st, so they must think that they are finished or at least have something good enough to warrant a call to action. I became attracted to Digg years ago for some of the same reasons I am attracted to SEO. The little guy has a chance to win. Digg is like a game–Digg has always been a place where one could achieve popularity by sheer force of will. If you work hard and the determination is there, you might even find yourself a Digg poweruser who frequently gets stories to the front page and commands lots of votes and social popularity. The best example of a Digg poweruser is the number one user based on Digg 3 statistics, the famed MrBabyMan. Apparently statistics have been removed from Digg 4. Powerusers on Digg or any other social media site are the influences, the cavalry, the frequent flyers, the people who enjoy promoting your service for free. Several of them even have created their own webcast shows. Take away bits of their power as Digg has done previously? Okay. Ban powerusers who violate the terms of service? Sure. But, remove their ability to influence front page stories and you have a revolt on your hands. I am not a top 100 poweruser but I have had a number of news stories make the front page thanks to my friends’ diggs. I’ve never experienced anything quite like this Digg change. I invested time in developing friendships, virtual backscratching, voting, commenting, etc and it-the thing I came there for-goes away. And, by the hand of the owner and creator of it all. This masochistic, self-destructive tendency has always bothered me about the site I invested so much time in. Why not just go somewhere else? Facebook will always be there. StumbleUpon for the 2 seconds of boredom while a program loads. Twitter is there. I don’t like/get Reddit. Mixx is okay. 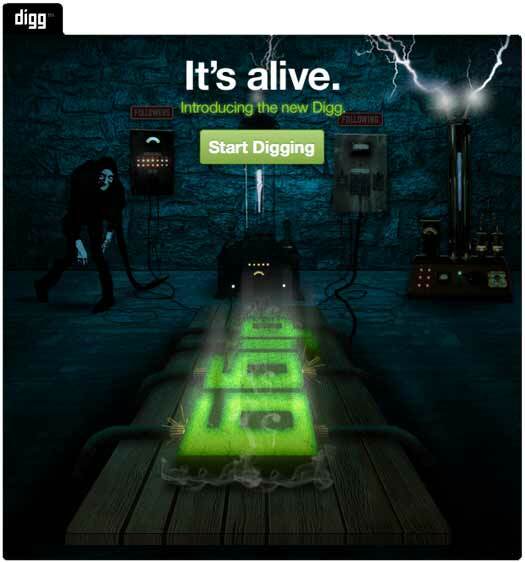 No matter how good your Pligg site is, it can’t hold a shovel to Digg 3. There was nothing like it. bahbye, am sure something better is in the horizon (it always is :)). Great analysis clickfire. I was out of town when the changeover took place, and I sure do miss Digg and all the friends I made there! I’m still reserving a hand shovel of hope that digg will change. Digg is dead to me now. What is the difference between New Coke and Digg V4? At least you could use New Coke to wash your feet with. I’m so very glad I’m not Kevin Rose, the pit of his stomach must be somewhere between the temperature of the sun and the temperature of Hades. To have made such an epic blunder, he may get lucky and have his name attached to a concept taught in business schools of the future.